It's September, and Spring has sprung! Well, kinda! After a totally gorgeous and sunny weekend, with temperatures in the mid-twenties, we seem to have reverted right back into cold winter weather. Boo! 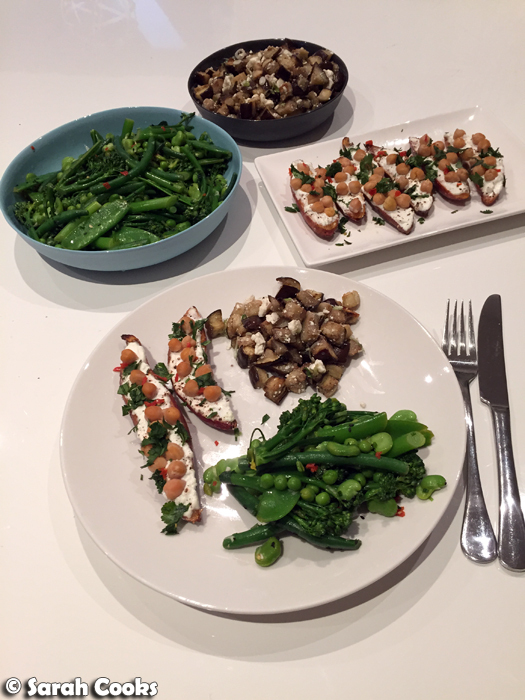 So I present you this fresh springtime recipe in the hope that the weather improves soon! I made this salad the first weekend back from Germany, when I was in dire need of some vegetables. (Blogposts to come, but the month in Germany was essentially a glorious potato-and-pork-extravaganza). We spent a Sunday afternoon food shopping, and then I pottered about the kitchen for a few hours, preparing loads of vegetables for dinner and for the week ahead. Ta-dah! I must say, I was quite proud of my efforts! The sweet potatoes and the eggplant salad were also great, and I'll share the recipes with you soon! But back to the green salad. I'm calling it a "Spring Green Salad", but given that some of the ingredients are frozen, you could easily make this any time of year. It's kind of a mash up between Nigella's Pasta Salad Primavera, and Ottolenghi's Spring Salad - basically it's a bunch of different green vegetables, each cooked until tender, then dressed in a mixture of lemon juice and olive oil, perked up with chopped chives, chilli and black sesame seeds. 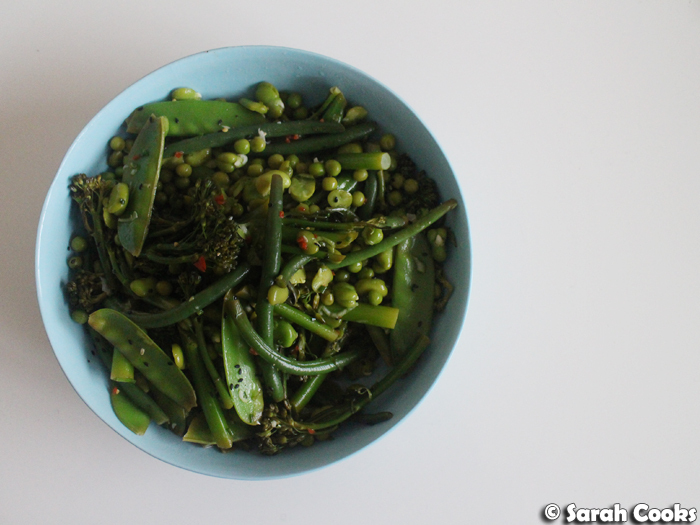 I picked vegetables that looked good at the supermarket (snow peas, green beans and broccolini), plus my favourite frozen standbys: peas and broad beans, but you could use whatever green vegetables you like. (Asparagus is an obvious contender, but the asparagus looked a bit crap when I went shopping, so I didn't bother with it). The salad is a little fiddly to make, but not difficult, and making a big batch of this on the weekend gives you a tasty and healthy vegetable accompaniment to eat throughout the week. (By itself, with some grilled fish or meat, or however you like!) If you were serving this all at once, rather than picking at it over a few days, then I'd suggest adding some diced avocado as well - delicious. Place the broad beans in a bowl, and pour over enough water from a recently boiled kettle to cover. Once the beans are cool enough to handle, squeeze the inner beans out of the shell. Place the beans in a serving bowl and set aside. Trim the woody ends from the broccolini, and slice the remainder into thirds crosswise. Trim the snowpeas, removing the tough string that runs down the side. Blanch the broccolini pieces for 3-4 minutes, or until tender, then use a slotted spoon or a pair of tongs to transfer them to the iced water. Blanch the green beans for 5 minutes, or until tender, then transfer to the iced water. Follow this with the snowpeas and then the peas. Drain the vegetables well, and add to the broad beans in the serving bowl. Mix together the chives, lemon juice, chilli, black sesame seeds and olive oil. Pour over the vegetables and toss to coat. Season with salt and pepper. Ahh, I can see Ottolenghi's influence in this salad with the lemon and chilli (also could have been influenced by Nigella!) I'm so looking forward to spring and perhaps making this salad! This looks yum - I love anything with broad beans! I definitely need more broad beans in my life. Love this salad idea - sounds so reviving!